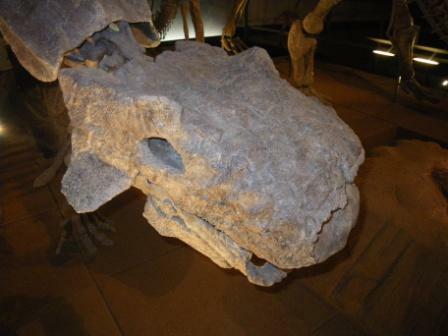 Have an ankylosaur skull. Euoplocephalus apparently (I would not claim to know much about ankylosaurs so I’m going with what it said on the sign). You want *more* than this? OK, well ankylosaurs are actually quite interesting but in their own way they rather suffer from the same problem as pterosaurs. That is that their taxonomy is rather problematic since a lot of the characters you might expect to find to help sort them out are concealed. In pterosaurs its due to the way the bones are sutured in the head and because they have a very conservative bauplan, in ankylosaurs it’s the armour getting in the way. As you can see here, the cranium is essentially a box with holes for the eyes and nostrils and so you can see how it might be tricky to find out how all the underlying bones are moving around and changing shape (evolutionarily) and thus work out which features various taxa have in common or were they differ (or even if two animals are the same species or not). Today’s post comes courtesy of Tom Holtz. Obviously being British, Thanksgiving passes me by at the best of times and living in China, I usually only register it when suddenly blogs and websites go very quiet for a few days. However we do usually revel in the Christmas turkey this is hardly an inappropriate post on the theropod ancestry of turkeys. I’ve been brushing up on a few museum and zoo reviews for posting and it occurs to me that often my biggest complaint with an exhibition is a lack of good signs. I’m not talking here about absolute basics (“This is a Brachiosaurus” – though even some places seem to eschew this minimalist approach) but pretty much anything more detailed than that – be it the age and geographical origin of the organism or a complete display about the phylogeny of the clade and it’s more interesting anatomical features. A great many places of supposed public interest and education seem to rather lack that second aspect because of a lack of signs. Sure it’s educational to stand in front of a hall of bones or a paddock full of antelope, but signs add so much more. It is, let’s face it, uneconomical to have people standing around answering questions and interfering with people’s days (and indeed these can be intrusive and annoying) and a good sign can communicate lots of information without being dull or taking up a lot of space. The obvious point to make might be that not many people *want* to read the signs, but this is misleading. I can’t imagine anyone buys a newspaper and reads it cover to cover – some people want the sport, some the stock indexes, other the comments, or the lifestyle section and so on. Everyone will likely get something different from the paper in differing combinations and amounts. If you don’t *want* to read a sign, then fine, don’t. But even if it’s a minority, I’m sure that lots of people *do* want to learn more about what they are looking at. At the very least it’s almost criminal in a zoo or museum not to tell you the name of the species you are looking at. The one thing you hear more than anything else in these places is a kid asking a parent “What’s that?” and without a sign to hand often there’s no obvious answer forthcoming (or a wrong one – I one, honestly and truly, saw someone call a giraffe a ‘zebra’ once). Kids who get their questions answered are going to learn something and might keep up that interest / trait to ask questions. Those that don’t, will not. Even if they don’t take much in at the time, the name will likely be remembered and can be looked up later. And this hardly takes into account adults – plenty of people do read signs and want to learn more and that’s tricky without the information being provided. 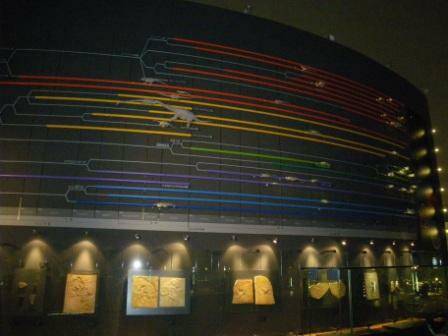 There are of course some truly great signs out there, original, inventive, informative and exciting (like this dinosaur tree I have been meaning to show off – a complete dinosaur phylogeny with little models to represent the various clades). But signs need not be huge or dramatic or expensive to be informative. Something simple to say the same of a species, which family or higher group it belongs to, how big it got, when and where it lived and what it ate need not take up more than 6 inches of wall or display space and actually tells you quite a bit. I really think there is almost no excuse for this kind of sign not appearing next to pretty much every single display – it’s simple and informative and unambiguous and is hardly likely to go out of date (unlike say the average sign of dinosaur behaviour, or the names of all the meerkats in the enclosure) making it cheap and easy to install. These should be used in conjunction with bigger displays and signs with greater depth, but something small and unobtrusive that will both no-one while informing many, and is quick to scan and digest should surely be essential for just about anywhere that wants to inform its audience. So being eight hours out from the UK and 12 from the US east coast it’s perhaps no surprise that I missed (forgot) that yesterday was the anniversary day of the publication of the Origin. While I totally failed to celebrate, Scott Sampson did not and chose this rather auspicious day to launch his new blog – The Whirlpool of Life. Scott will be covering mainstream science education and communication as well as all aspects of nature and biology and not just palaeontology and the dinosaurs on which he usually works. Nip over there and take a look when you have five minutes. Beijing is actually home to three public aquariums, but the one I’m covering here is actually inside the Beijing Zoo, though it can be visited separately hence the separate review. It’s also big enough in its own right to warrant a separate review since it can easily occupy three or four hours of your time. It’s rather new having been open only since 2003 I believe. Having covered the ongoing saga (though to be honest it’s less of a saga than a small novella) of the ‘cranial-caudal’ descriptions issue, it seemed an appropriate time to bring up the ideas of directions in anatomical descriptions. As I noted in the earlier post, the point about directions in anatomy are to be clear and concise and to provide an unambiguous definition of something to avoid confusion for the readers and researchers who want to follow what you have written accurately. It should be easy to see how people can get confused without being careful about terms. You could describe a feature on a humerus say as being on the same side as the thumb, but rotate your wrist and suddenly that point of reference disappears. Most people would describe their chest as facing forwards, but in a quadruped that same structure (the ribcage) would be facing down towards the ground, and while the metatrsals in our feet face flat down on the ground in most other animals they would face backwards. If you used terms like this it would be easy to get lost or end up comparing the wrong things hence the general standardisation of terms. I say general of course as there are still issues here and there that crop up, like the cranial-caudal one, or those of the scapula. Anterior (or cranial) – towards the head end of the animal. Posterior (or caudal) – towards the tail end of the animal. Dorsal – towards the back. Ventral – towards the front. Medial – towards the midline (something can also lie medially like vertebrae). Proximal – towards the body. Distal – away from the body and towards an extremity (so you can also talk about the distal tail for example). Palmar (or plantar)> – towards the palm of the hand / sole of the foot. Dorsal – towards the back of the hand / top of the foot. Labial – towards the lips or outer part of the mouth. Lingual – towards the tongue or inner part of the mouth. These rather obviously all come in pairs of opposites but they can be used together or in combinations. So your spine is medially positioned and runs anterio-posteriorly (from front to back) and while your orbits face anteriorly (or rostrally if you prefer) you can swivel your eyes to face dorso-laterally (up and to the side) or medio-ventrally (down towards the middle) if you so choose. The point is, and should be, that even as joints move and rotate and even whole body plans change and evolve (humans stand rather differently to monkeys, let alone cats or mice) the points remain relevant and accurate and directly comparable. Thus providing a secure set of references to make both descriptions and comparisons accurate. *and by ‘do’ I mean ‘bother with’, but for this it should be more than sufficient. I got into a discussion with my colleagues the other day about the merits of collecting multiple specimens of taxa versus collecting something new. The reality of course is that there is rarely a choice to be made – you bring back everything you find in the field that you can. 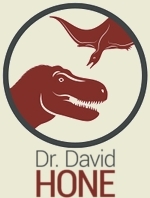 However, as a hypothetical discussion it is interesting since of course you can do very different science with 10 specimens representing 10 different species and 10 specimens of a single species. This debate aside (one for another time) it led me to get around to writing this post which I have long intended to complete on the differing importance of different specimens. It is understandable that some people might think “so you have 25 Triceratops, so what? Surely once you have one good, complete one, there’s not much more to learn?” but of course this is far from the truth. As I have covered before on my series of posts on taxonomy, multiple specimens can give you a huge insight into the variation of fossil animals as living organisms – be it intraspecific or sexual. If animals are of different ages then you can learn about ontogeny and growth and of course there is always the change that a new specimen shows off some odd characteristic like a pathology, bite marks from a predator or something like this. Some specimens (and the fighting dinosaurs are a great example) cannot easily be prepared for research, no matter how good they are (or in this case, not without losing a lot of other important information). Another specimen where all the bones can be separated out and viewed and analysed in 3D is great therefore allowing all kinds of extra information to be accessed and things like range of motion in joints to be examined firsthand. 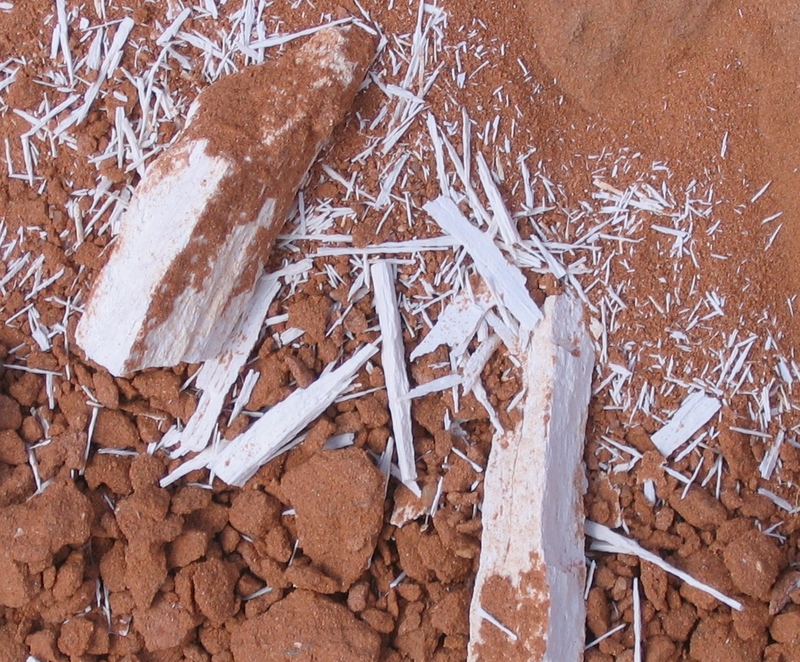 Similarly, having a ‘sacrificial’ specimen is great – no one wants to chop up a brilliant holotype to look at the bone histology or look at replacement teeth or the braincase, but a second specimen allows you to be a bit free-er with your methods and destructive sampling becomes a serious option – even a very fragmentary partial bone can be enough for this. OK, maybe we don't need to collect this. So while obviously for most palaeontologists a single complete skeleton is a great find, every little specimen is valuable. However, it would be a mistake to consider each of equal value – a single broken femur is good for destructive sampling, but an articulated leg is more useful and obviously several complete animals are better still. Even this varies from researcher to researcher – histologists are likely overjoyed by a bunch of otherwise largely unimportant partial specimens that they can sample while behaviourists won’t get too worked up until they hit a whole herd preserved together. I imagine most of this is largely very obvious, but still there is typically always one more angle to think about and I hope I may have highlighted one or two here. It’s easy to get stuck in the mindset of ‘what would I do with that fossil’ which might be very useful for you, but not always that of your colleagues. 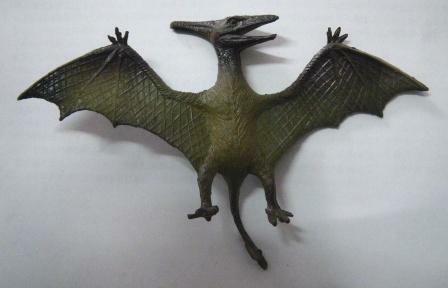 A couple of months back I posted an image of a ‘flying’ mount of the odd pterosaur Dsungaripterus taken at the IVPP. 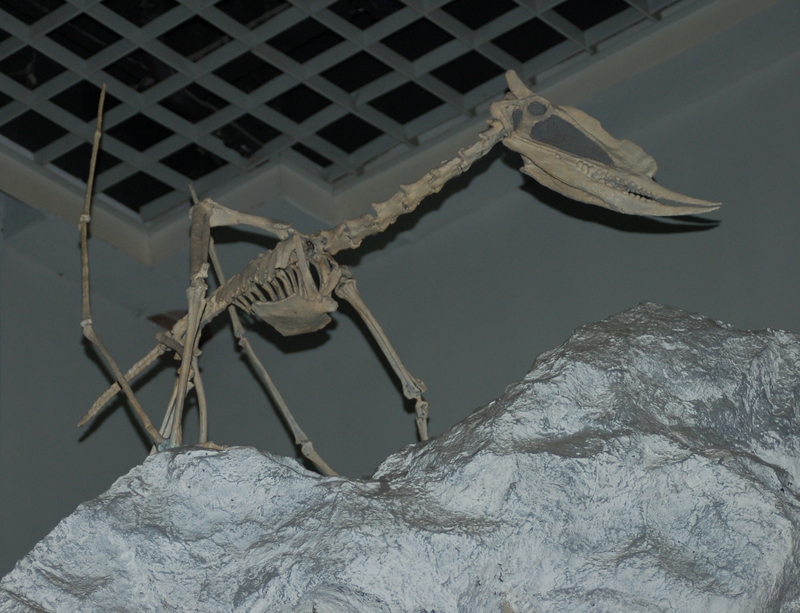 I had intended to include, but completely forgot, this image of a walking mount from the Beijing Natural History Museum. 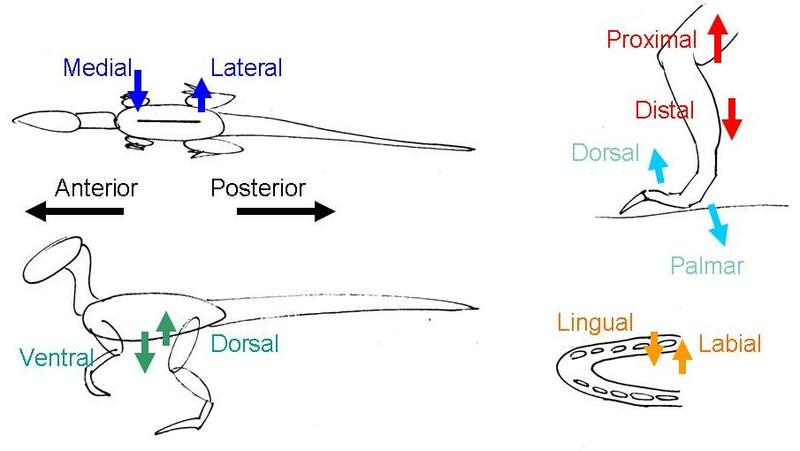 There’s not much to say here since I have already covered pterosaur quadrupedality and at least a few more details on Dsungaripterus in the last post, so I’ll leave this as a short picture post. A while back I launched a rather unsuccessful appeal for archosaur images to use on the Musings since I actually don’t have that many that I have not already used. These are of course still welcome, so if you have any photos that you own the copyright for, and don’t mind me using publicly, and if they are of archosaur fossils / casts / mounts then do please send them to me! However this appeal is of a far more general kind. As I noted recently my main ‘online’ project Ask A Biologist is about to undergo a big makeover and we are also looking for any images related to biology to include in a big online gallery. So basically the same appeal applies but on a much bigger scale – please send me ANY images related to biology / palaeo that we can use. I should note that I do have a rather a lot of dinosaur, bird and mammal images already and we need some variety! Thus lings like people in labs, plants, cells, inverts, molecules, fungi, medicine related stuff, fish, non-dinosaur fossils etc. are especially welcome. Thanks in advance for your help, it really is greatly appreciated.